Given this raw material there is something to be said here. But I can’t quite pull it together. Something about how coupons are are a way to overcome the buyer’s impulse control? Something about how no market is immune to discriminatory pricing? This may well be the most evil thing I’ve yet encountered in my hobby around pricing games and shaping consumer behavior. They bought an out-of-patent drug (Sodium Seconal) which is used in physician assisted suicide – and after the California government passed laws to make the above legal they jacked the price up to $3000. … consistent with Valeant’s business model there is a copay coupon so that you, dear patient, are not out of pocket, whilst your insurance provider takes the hit. This entry was posted in business modeling, economics on March 24, 2016 by bhyde. Amazon Prime not a luxury good. One of my favorite insights about pricing came from thinking about why bespoke tailors never discount. The fun bit was the realization that sales (discounting, coupons, etc. etc.) are about impulse control. Both players, Betty the buyer and Sam the seller, are tempted by discounting. Sam discounts because it helps to close the deal, since it helps Betty to overcome her impulse control. So Sam is very tempted; and that temptation means he’s got an impulse control problem too. At it’s core the discounting acts to expedite the sale, it’s an accelerant. But yeah, if Betty knows that Sam is given to discounting that knowledge dampens sales! For example there is a men’s clothing store near my office, but I know that everything in can be had for 40-60% less than the usual asking price. But only if I play the pricing games this vendor uses. I “just” need to puzzle out what those are and then: wait for the sale, get the coupon, and buy the gift card in the secondary market, order online with delivery to store, and finally exchange what I bought for the item I really wanted in the store. When the bespoke tailor clarifies that he never discounts he’s signalling that his goods are a luxury item with a lot of bundled benefits. Betty should not be making the purchase decision based on price! Price should never be the deciding factor in the purchase of a luxury good. Presumable Brilliant Bob can skillfully compute the cost of the dampening v.s. the benefit of the accelerant. The drug store knows that a lot of their buyers need it now, and hence has less fear of the dampening. The big department store knows that most of their Betty’s are skilled shoppers and enjoy the game. The combinations are numerous. But one place this leads is the realization one of the many inputs to price setting is the how much discounting head room the seller wants. So when Amazon raises the price of Amazon Prime to $99 they may hope that Betty thinks this is because it’s become so much better. More features, valuable, and expensive to deliver. But I suspect it’s that they decided to play more pricing games with that offering. This entry was posted in business modeling, economics on September 25, 2015 by bhyde. Getting the annual before Thanksgiving hair cut I amused myself by trying to convince the Barber that he should introduce surge pricing. I mean! How are Uber drivers to know they should lay down their keys and take up their clippers. Who is he to deny the market it’s signal? Does not the market have rights? This entry was posted in economics on December 1, 2014 by bhyde. The standard model for economic recessions is that people become nervous and then proceed to hide under the mattress with their money. That reduces economic demand, which in turn makes everybody more nervous. What you need is to tempt them, and their money, out of hiding. If you are a commercial enterprise and you want to tempt people to spend their money you labor to generate more demand for your product. Demos, freebies, events to entice ’em into the store, advertising, coupons, etc. etc. Recently I stumbled upon an interesting variation on this. Like most vendor loyalty clubs, Sears/KMart has a loyalty club where you earn points. I’m quite impressed by the range of tricks they play with this micro-currency. For example they use classic intermittent conditioning to train customers to come into the store. When you enter the store their app, on your smart phone, randomly rewards you with some points. I got $10 the first time, presumably so I’d be sure to know that visiting the store might be valuable. For example they used the class trick learned during the great depression that if your want your micro currency to work well you should design it so it loses value if you horde it. So many of the points you get have a limited lifetime. One trick they use that I find particularly thought provoking how they pay you to shop. They have dozens of “contests” where you answer a few questions (“How old is your Vacuum Cleaner?” “How often do you use your Vacuum Cleaner?” …) and then you must “like” a few items in the Vacuum cleaner section of the catalog. Having done this you are then entered into a drawing for – oh – a 100$ worth of points. They actually tell you how many people have entered, so I can see that for a very low cost they got a thousand people to think about their Vacuum Cleaner and browse the catalog for a new one. It’s a glimpse of the future. For example the micro currency lets them make micro payments for all kinds of activities that aid their business. For example 50 points (5 cents) for reporting your weight to their little fitness club. They also let you register your fitness device or app and get micro-payments for exercise, which only raises the question why it is taking so long for the fitness device makers to sell that service to health insurance companies? Why don’t airlines or the grocery stores play these games? Why doesn’t Amazon? I think mostly because they haven’t realized the potential in their loyalty card/points programs to engage in behavioral gimmicks to train customers and draw customers into the shopping. But of course to a limited extent they do play these games. I find the idea that the Government could use techniques along these lines to generate address a recession extremely provocative. Hire 5% more workers and it enters your firm into a sweepstake for $250 thousand dollars, etc. etc. This entry was posted in business modeling, economics on July 5, 2014 by bhyde. Touch labor isn’t a widely used term. In accounting, I gather, labor is sometimes partitioned into direct and indirect. Managers and janitors are indirect and assembly line workers are direct. This entry was posted in economics on April 30, 2014 by bhyde. 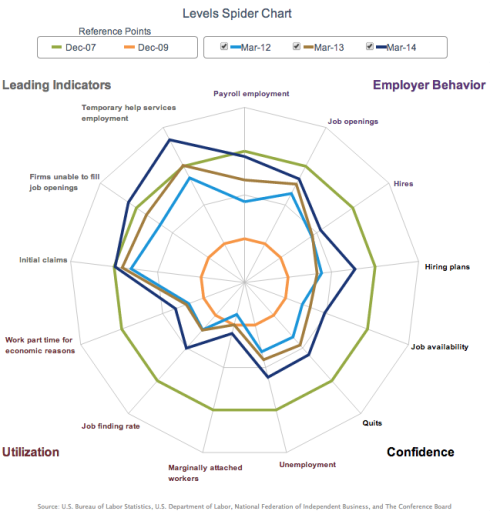 It shows three samples (March 2012, 2013, and 2014) of thirteen metrics for unemployment. The designers scaled these various numbers by using two reference points: December of 2007 and 2009. I.e. just before and after the great recession started. The reference years appear on the chart as two circles: the inner circle is the bad year 2009, and the outer green circle is the good one. You can see how over the last three years things are getting better, but not much. The 13 metrics are in four rough categories as indicated by the labels in the corners. The metrics that tend to suggest the future have improved the most. The facts on the ground, i.e. while, aka utilization, have not improved much.. The scale selected is good, but it’s worth pointing out that 2007 was fairly disappointing. Consider this next chart. 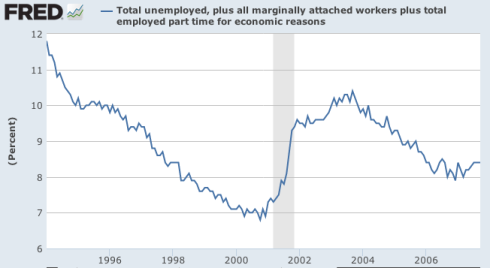 That shows the U-6 unemployment rate. The recession that followed the bursting of the Internet bubble is the gray band. So in 2007 the concern was how we seemed unable to achieve utilizations close to those of the 1990s. 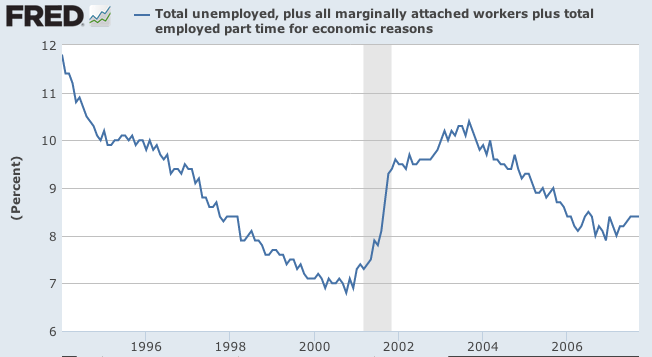 Shortly after this chart ends the U-6 rose to 17%+. Another critique, I suspect payroll number (and others?) are not adjusted for population growth. This entry was posted in economics on April 29, 2014 by bhyde. Piketty #2: Meritocracy – Don’t I get a Badge? Broadly speaking there are two variants of meritocracy. What it’s not: i.e. it ain’t inherited wealth. What it is: achievement. We sneer at one and admire the other. The admirable one is, presumably based on skilled application of one’s talents. One term of art for talents is knowledge capital. I’m not sure how that term came into being. A suspicious soul might think it was a way of distracting those without real capital into focusing on something else. Since yeah, knowledge shares little in common with capital. It’s a public good for heaven’s sake! Largely excludable and non-rival; the opposite of capital. Further, capital is easier to horde, transfer, diversify, steal, measure. One of the points Piketty likes to highlight is a distinction between in today’s discussion inequality and that seen in the late19th century. Today we have taught the poor that it’s their fault. They lack merit. That’s kind of cruel. But it hard to believe that 19th century observers didn’t enjoy “blaming the victim.” One insta-theory I’ve come up with is that the observers hadn’t yet sworn allegiance to the new industrialists. Or maybe they had different just-so-stories to explain the plight of the poor. The fun thing about science is that we demand something of our models. If you say that talent (or knowledge capital) is an important contributor to inequality that’s fine. But if your want to cast that into a scientific theory then you need to say a bit more. You need to predict something that would aid in it’s falsification. Piketty provides a hint at that. If since the 19th century knowledge in the hands of highly skilled and educated labor has become more valuable one might expect that the share of total GDP captured by talented labor would increase. You can measure that. He has. It hasn’t. The share of capital v.s. labor has remained stubbornly constant over the 20th century. This is not to say that knowledge is unimportant. But, I recall a little story Warren Buffet is said to have told about how his executives would come and pitch the advantages of some wonderful new machine. It would lower costs! It will raise profits! I need capital to bring it on board. Look at this great spreadsheet, what an awesome investment this is! An then by the time it had come on-line the competitors would all have something similar. Sadly the return on investment was then lame. The rising tide of knowledge lifts the economy. The resulting name can be deadly or delightful for individual players. But the discovery that the talent’s share of GDP v.s. that of capital has remained constant means it does not help the poor. Or to put it another way it doesn’t change the shape of the inequality curve. If your going to explain wealth and income inequality your gonna need another story. So, back to that video. It would be fun to have a little museum of magical knowledge transfer devices. I recall, as a child, that you could buy a little speaker to slip under your pillow and by recording stuff you could magically learn stuff. Hypnosis has always promised to provide this, and these days we have MOOCs. That video shows a cartoon machine from the 1960s the “Brain Impulse Galvanoscope Record & Transfer”, or BIG RAT. Did I mention rat race? I’m greatly amused at the idea that these machines are technical efforts to create exchanges for knowledge like those for money. I don’t think it comes as any surprise that Google is attempting to be that middleman. This entry was posted in economics on April 19, 2014 by bhyde.